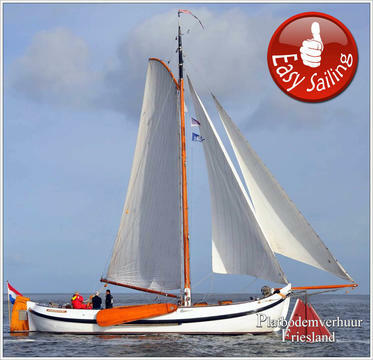 Have you ever done yacht charter Lauwersmeer? Have you ever gone to Lauwersmeer with a charter boat or yacht? Happycharter, your specialist for yacht charter, boat rental and boating vacations, has got the right boat for rent for everybody. This vlet with 9:50 meters in length offers both an aft cabin with 2 single beds (~ 1.80 meters long ) and an open cockpit to enjoy sheltered the sunset. The Aventura AK 34 is the right ship for an extremely luxurious boating holiday for 4 people. This yacht with its classic lines offers the crew all the comforts they could wish for. If you want to enjoy with 2 people a comfortable cruising holiday, then the Aventura 34 OK Classico is the perfect boat for you. Simmerskip 1200 AK, with the aura and the timeless contours of a rugged work vessel. Not a typical charter boat off the rack. Stainless steel details, Teak benches permanently mounted on the aft deck's outer appearance. A very nice model with spacious open sitting area for 2-4 persons and equiped with inside and outside steering unit. This boat, with its classic frame and built to the best standards, provides a great deal of space and comfort. In the front part of the boat is a shower with washstand and a separate toilet. There are 2 spacious single beds in the bow. Do you offer yacht charter Lauwersmeer by yourself? Or do you hire charter boats and charter yachts in other areas? Boat rental of sailing yachts or motor yachts? Sign up and add your sailboats, powerboats, houseboats or catamarans for rent into our yacht charter data base!